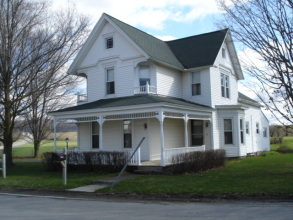 This beautifully kept Victorian just a few miles outside of the Village of Hamilton offers great living spaces throughout including double parlors, dining room, eat-in kitchen, 4 bedrooms and great front porch! Original interior features such as hardwoods, beautiful oak trims, mouldings and doors are all perfectly preserved and detailed. Outbuildings offer garages, workshop space. A wonderful home proudly presented.